This section does not describe the process for rebuilding a stock (or relatively stock) 3S-GTE motor. Many of the stock components have been entirely replaced on this motor, such as the turbo system, wiring, ignition, ECU, etc. 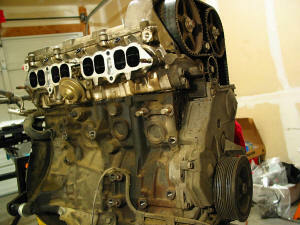 Thus, it probably has limited value as a "How-To" guide for rebuilding your motor. However, it may help you to decide how far you wish to take your upgrade plans. The 3S-GTE is a motor that responds relatively well to small, affordable upgrades, like exhaust and intake improvements, a boost controller, etc. However, once you install the "easy" fixes, it can get complicated and expensive very quickly. You don't want to be halfway through your upgrade and find you simply cannot afford to continue. Hopefully, this guide will show you what some of the modifications entail, and you can price out the parts to get an idea of the overall material costs. Also consider that there are considerable out-of-pocket costs involved in simply putting the motor back into the car. Hoses, brackets, fittings -- they add up very quickly. Also, this section describes the work I was able to perform with the motor out of the car on an engine stand. Work that was performed after the engine was installed into the car is covered in the Install section. This includes much of the wiring, plumbing, etc. My friend Alex Labeur performed the actual blueprinting and assembly of the long block. My role was deciding what I wanted to do to the motor, getting it to Alex for the teardown and reassembly, and then putting everything back together. Alex then disassembled the motor, noting any indication of stress or damage. He told me that there were small signs of detonation in a few bearing surfaces, but otherwise things looked good. The motor was pretty clean for 86,000 miles. Once Alex got the parts back from the machine shop, he proceeded to blueprint the new motor. The planned upgrades included JE forged pistons (8.5:1 CR; .020" over), ARP rod bolts, head and main studs, Si 1mm oversize valves, WebCam reground cams, Engle valve springs, and some cleaning out of the port areas. 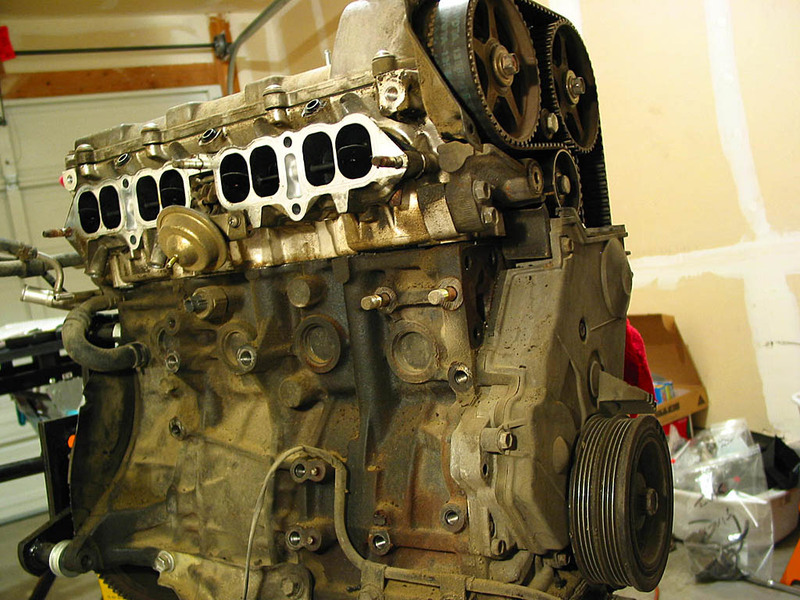 The oil pump and water pump were replaced, as well as the cam gears (with HKS adjustable units), timing belt, tensioner, idler pulleys, seals, etc. This was essentially a brand new motor. Alex and I had discussed using shimless buckets from the MR2 Spyder. This was attractive from the standpoint of achieving a lighter valve train, but a real pain for sizing the correct buckets, as the cams needed to be removed for every "adjustment". However, this was the time to do it. The shimless conversion led to an unforeseen problem: the shimless buckets had only about half the adjustment range of the stock shim-and-bucket arrangement. The combination of the new buckets and the new valves resulted in a clearance gap between the valve stem and the bucket, even with the thickest bucket available. The only permanent fix was to reseat the new valves in the head a bit deeper. In essence, another valve job was needed. I bit the bullet and had the work done. The assembly sequence was dictated by many things. As it proceeded, I kept finding things I needed to buy or fabricate, so in the interim I would try to move forward by assembling another part or system. It was very frustrating, as it always seemed like something was going wrong, but I guess that's to be expected when you change the OEM specs to something new. I used ARP flywheel bolts, which require a 19mm 12-point socket. The foot fits in between the gear teeth, and it actually holds tighter the more pressure you use on the bolt heads. A perfect tool for only a couple of dollars. It also works well for installing/removing the harmonic dampener bolt on the other side of the motor. I numbered the bolt heads with a Sharpie marker to match the BGB's tightening sequence, so I could keep track of which bolt I was tightening. (OK, so I'm obsessive about some things.) With the flywheel in place, I put the motor on an engine stand, making it easier to work on. I couldn't install the upper cover just yet, as I needed to add a cam timing sensor for the TEC� and I also needed to cut holes for adjusting the cam gears. Oh, well. At least I'd have access to three of the exhaust runners for temperature measurement. 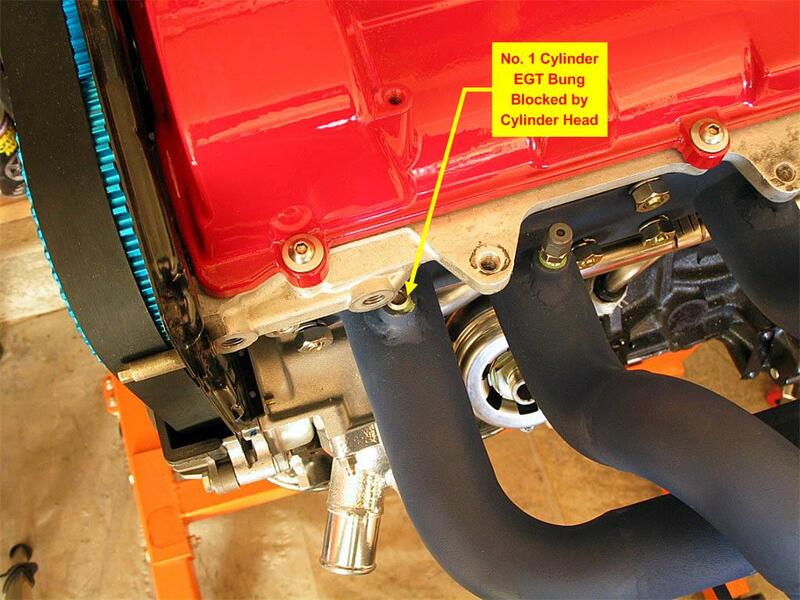 I installed new intake manifold studs with a medium strength thread lock compound, so I could dry fit the intake manifold and see how clearances were working out. I used Permatex Ultra Black RTV sealant. It's suitable for high temperatures and is O2 sensor-safe. New valve cover gaskets, of course (Toyota Part Nos. 11213-88381 and 11214-88381). Be very careful when torquing the valve cover screws. The measurement is in inch-pounds, not foot-pounds. Sharp-eyed observers might note that the cover is an older (91-92) style cover. I'd bought this cover a while back, and then had it powder coated. The plug is just a rubber seal with a through-bolt that expands the seal to fill the hole. I replaced the stock washer with a stainless one for appearance's sake.